The 1980s saw many casulties of the video format war - Philips' V2000 and VCR formats, Sony's Betamax and Funai/Technicolor's CVC. But one never even got off the ground. Even at the beginning of the decade, video piracy was seen by the studios as a real problem. In 1981, the British Videogram Association estimated that a staggering 78 per cent of pre-recorded cassettes being sold in the UK were pirate copies. 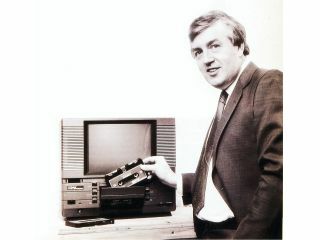 Enter Gordon McNally's 'McNallyVision', which was billed as a low-cost playback-only system to be built in the UK. All kinds of bizarre claims were made of McNallyVision - including the ability to produce colour from monochrome film stock by "scanning with a stationary laser projected through red, green and blue filters". There was to be a range of three players, capable of producing images on a self-contained back-projection screen. To win over the studios, McNallyVision would "eliminate piracy" by using "chips about the size of an audio cassette" inside each £12 film-pack. This "chip" would complete a "secret digital code" inside the machine, thereby authenticating it and allowing the pack to be played. Eventually, it became clear that McNallyVision was nothing more than a self-contained 8mm film projector - and the public and City (to which McNally was pitching for investors) dropped the system.